The Ship Model Forum • View topic - At 'Em Arizona Fans! Post subject: Re: At 'Em Arizona Fans! Quick question about Arizona. Were all the exposed 5" guns, 5/25's? And only the guns in the casemates were 51s? A guy that likes too many types of kits. Namely pretty much it all interests me... UGH, right? For 1941, yes; but for a while she carried two additional 5"/51s in the open, where the forward 1.1" quad tubs were later placed. 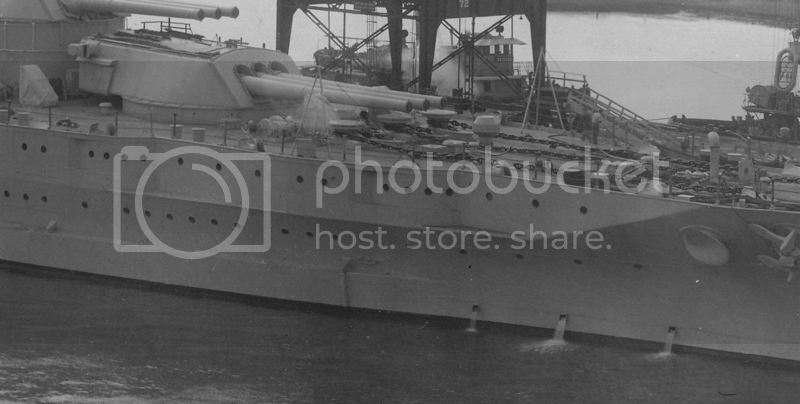 I found what seems to be a slightly better copy of the bows on photo of the modernized Az on the online National archives. I cropped out a few selected sections that are of interest. The first photo is in the bridge area on the deck with the open 5inch 25 caliber AA guns that looks like a speaker with a bell above it. The bell would have been used to indicate GQ. The second photo is of the bow area showing a teak deck leading up to the curved bulkhead. This was the only edge that I saw a teak deck on. Thought these details might be of interest. PS The model arrived today and it looks like the one with the additions for the RC version (including the raised plastic with an opening were the gun deck would be). I'll have more after I get a chance to really look it over. File comment: Looks like a speaker with a bell above it. File comment: Wood decking on edge leading up to curved bulkhead. Well one thing I've noticed already about the model is that the bulkhead in the photo above with the wood decking is not as curved on the model. The other issue is the lip below the part of the bulkhead with the portholes is the same width all the way around on the model. In the photo the lip almost disappears at the front edge. It also still has the elongated port holes on the front at the bow and I'm sure all the other issues with the hull. I'll probably fix the portholes, but I'm not sure about that bulkheads at the front of the bow. that bulkhead is in the shade so probably does not taper to nothing at the end but is recessed same distance all the way around. Holy Crap Franz! That is a very interesting find! I would have never thought there would be teak decking there. It begs the question why would there be teak decking there? It's not like its a high traffic area. I'm assuming that is a crop from a photo of the entire ship? If so, can you post the larger image? What is the date on that image? This overhead shot of her in 1939 suggests that teak was not there at the time but it is definitely worth further investigation. No doubt there was something there in 1931. Question is how long was it like that? Its from the already pretty detailed image on navsource I put that link below. The one on the National archives seems a bit crisper and that's why I saw it. You can make it out on the one from navsource if you look for it. The other question would be was it still there on December 7th 1941? It's from that group of high detail photos taken right after she was modernized. If nothing else it would be a great detail for someone doing the model from when she was first modernized. It definitely could have been removed at some later date. One thing I noticed about the model is that there is a bit of an indent running along the torpedo splinter a bit down from the top edge of the splinter. It's not present near the bow or stern part of the splinter, but runs all along the side. I do not see any evidence of this from any photos. Is that one of the issues with the hull on this model? I've also seen articles saying the splinter is not wide enough. Do you know if this is the case and if so how much should be added to the torpedo splinters? A most intriguing question, to say the least. I've found no similar photos of PENNSY, but will keep looking. 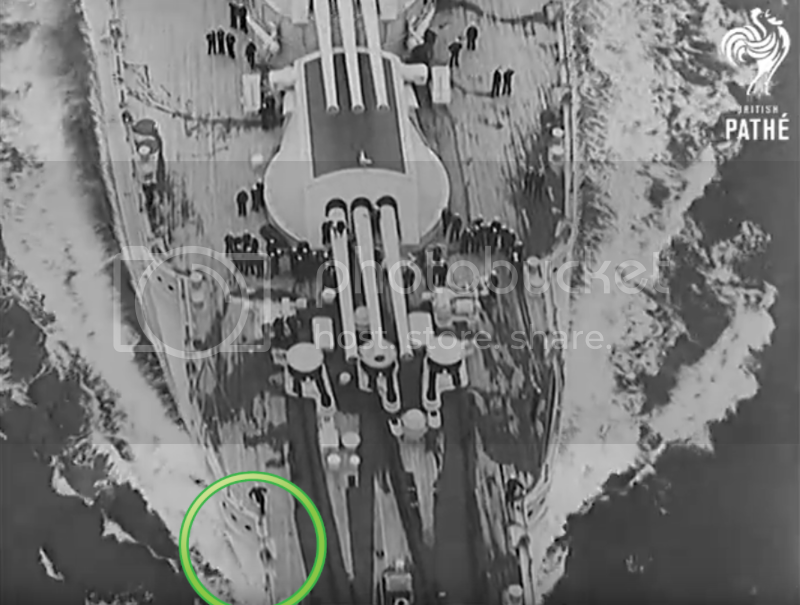 From the appearance of the link that Jeff provided (last post) the planking looks to be the same width as the main deck planking, so - probably from the same time period of modernization and batch of wood! 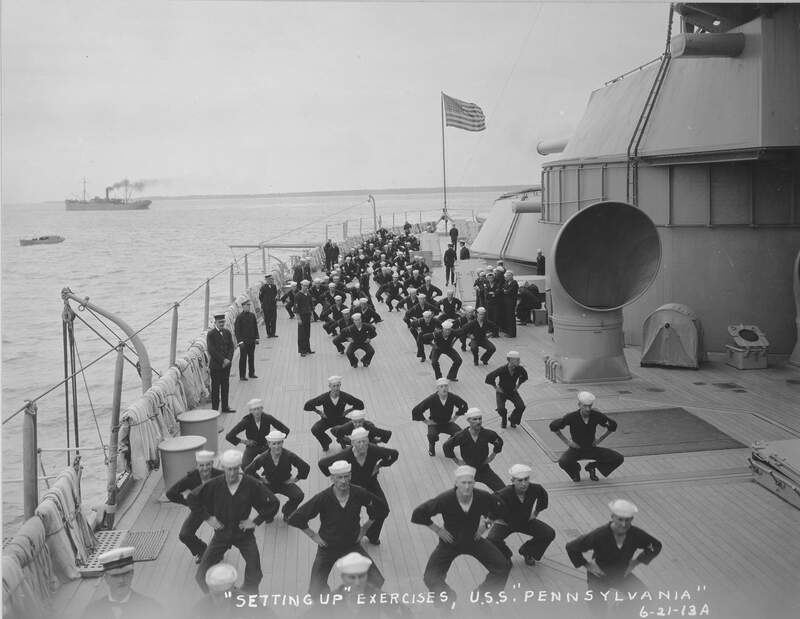 Has anyone been able to confirm a similar planking on the stbd side of the ship? If that were so, then it obviously was something "planned" rather than done as a last minute item by the shipyard. Also interesting is that the small triangular space behind this one is NOT planked. Dilemma No. 2!! 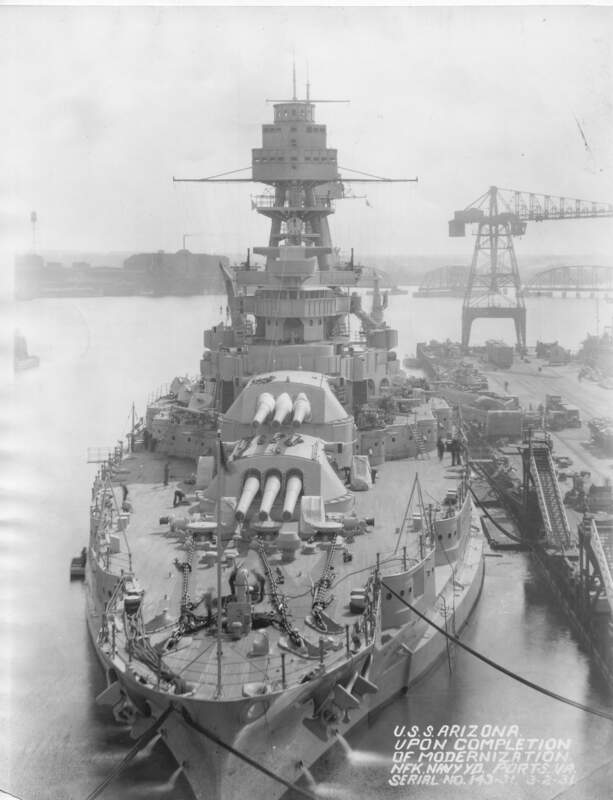 Is there any evidence that the bolted plate on the Arizona, like the one shown in this early picture of the Pennsy, was covered with teak decking in later refits? I haven't found any in my limited resources. I have completed planking the upper the deck and am now working on the main deck, which raises the above question. Every photo I've ever seen of this area on Arizona, these bolted plates on either side of the veggie locker are completely covered with teak decking. If you have Stillwell's book there is about 3 or 4 different pics showing this area. That reminds me of the bolted plate on the Trumpeter kit which is under the stern catapult. The plans agree there was one there but I could find no photo evidence of how it was actually presented. Was it raised up and exposed like the kit has it? Or was it teaked over like the two you referenced? I didn't spent a great deal of time analyzing the accuracy of the hull. I fixed just the shape of the Hawse on mine. I know a few people really analyzed it and pointed out all the dimensional errors. I don't recall exactly who but the two names that come to mind off the top of my head is Jason Channel and Tracy White. Im sure there are others as well. Thanks for getting back to me. I should have known that as you did your build as a waterline. Thanks for the names. I will follow up on them. I don't plan to do a lot on the hull, but if the blisters are wrong it's something I can probably fix. It just looks like making a crease flat. As far as any compound curves being wrong that's past my skill to fix. By the way great job on the hawse. I love the way they came out. I do have Stillwell's book. I didn't even think to look at it to be honest with you. I've become very dependent on you guys for answers when an issue pops up. In other words, I've become lazy. Sorry guys. It's just that you're so good at it. I'll try to be better next time. Hopefully I'll finish laying the deck planking tomorrow and start on the final sanding and varnishing come Tuesday. are overhead or side view. They don't have cross cuts like the 1924 plans. It may just be me not knowing how to read the plans better, but thanks. the 1924 bulges are the same as the 1941 bulges. I'm not sure they were the same. In Stillwell's book in Appendix E under the heading "Following Modernization, March 1931" page 360 he states "The increase in beam resulted from the addition to the antitorpedo bulges on each side. These bulges were each 4 feet, 7 1/8 inches wide." . So it looks like changes were made to the torpedo blisters in March of 31 unless I'm missing some nuance. At least from having to look that up I can now determine how wide the torpedo blister should be based on the widths given in this appendix. 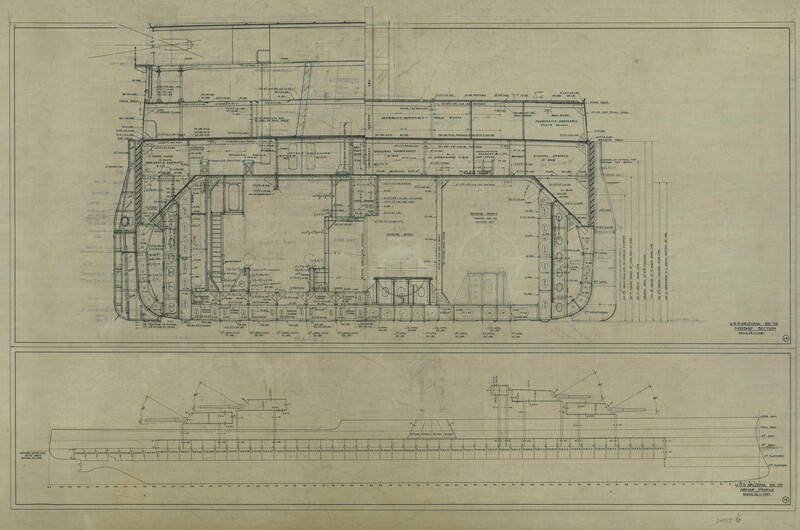 Franz, look at the bottom left corner of the frame drawing & you'll see the number 97' .05" outside of armor which is the width of the ship not including the bulges. including the bulges gives you 106.229' for total width of ship. I have that drawing and I did find that number. The problem I have with the drawing is I can't make out were it indicates the width of the blisters. Your overall measurement is pretty close to what Stillwell indicates in his book at 106 feet and 2 3/4 inches. I know I can subtract the original width of the hull 97.05 form the 106.229 and get 9.179 for the width of both blisters and half that gets me the 4.5895 for each blister. That would be the widest part of the blister. In the drawing the blister indicates it narrows towards the top. That gives me the impression that the indent on the model is close to being correct. I still don't know if the top of the blister on the model is the correct width because I don't see that information on the drawing. I know there is a scale of 1/4" equals 1 foot on the drawing, but without knowing the actual size of the drawing I can't print it out and take the measurement directly. Thanks for putting up with how slow I am.